This wine from the exceptional 2010 vintage was given 96+ points by Robert Parker. 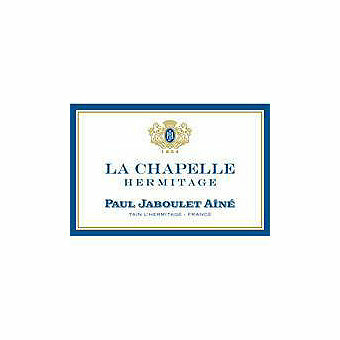 Hermitage La Chapelle is the crown jewel of Paul Jaboulet Ainé and a legend of this famous appellation. Since the legendary 1961 vintage, which was classed as one of the Twelve mythical wines of the 20th century, Hermitage "la Chapelle" has become one of the world's most sought-after wines. Contrary to popular belief grapes for La Chapelle are not sourced from a single parcel. Rather it is a masterful blend of the divers terroirs of Les Bessards, Les Greffeux, Le Méal and Les Rocoules. The varied richness of these assorted parcels join together to create a wine of incredible complexity and longevity. Grapes are handpicked and brought to the base of the hill in small sleds. The selected grapes undergo a strict sorting prior to vinification. Each parcel is vinified separately and aged for 15-to-18 months or more in the cellars of the domaine. Once the final blend is chosen, the wine receives additional time in barrel and is then aged in bottle prior to release to the market. This wine from the exceptional 2010 vintage was given 96+ points by Robert Parker who said "It should be fascinating to compare the potentially legendary 2010 Hermitage La Chapelle with the prodigious 2009 La Chapelle over the next 30-40 years. About 20% new oak was used, and, as were previous vintages, the 2010 was aged 15 months prior to bottling. This black/purple-colored beauty is revealing more weight and richness than it did last year from barrel, along with great precision, stunning minerality and enormous quantities of blackberry, cassis, beef blood and smoked game intertwined with hints of graphite and acacia flowers. With good acidity and richness as well as abundant, but ripe, well-integrated tannin, this great wine equals the titan produced in 2009. Forget it for 7-10 years and drink it over the following 30-50 years."